Craig Elliott believes Boston United need more strength in depth. 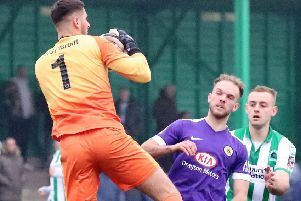 The Pilgrims face a blank weekend due to Stockport’s involvement in the FA Trophy, which will leave the side still smarting over their 4-1 defeat at Chester. However, United remain just two points off the play-off pace and Elliott believes a few tweaks can see his side back in the hunt. “It’s never nice to lose by that scoreline and think about it,” he said. “But it gives the lads time to rest and it’s quite obvious we need to improve the squad. Defenders Ben Middleton and Lewis Gibbens may be back from injury in time to feature in next week’s home contest against AFC Telford United. But if they are not, Elliott may be keen to add to his squad. He added: “It’s important we try to do that (bolster the defence) as we do have a small squad at the moment.